It’s an important question and one that all of us should have an answer to. Everyone has their own unique perspective, skills and talents that can contribute to making this a paradise on Earth. So what holds us back from getting clarity about how we can improve the world, and from going ahead and actually doing it? One of the main things is certainly lack of energy. However, most people don’t say this. They say they don’t have the time, or the money, or the influence, to really make a difference in the world, so why bother? Of course the truth, which we all know deep down, is — everything is possible if we have enough energy! We can always do things quicker or more intelligently if we have more energy. We get more time and we can raise more funds. Someone who has bundles of energy is naturally pleasant and charismatic and finds it easy to influence people to make the world a better place. Increasing energy has always been one of my main aims when helping people and it’s the main reason people come to me. However, is there something else, something that stops us from realizing our own power to really make a difference? I think there is and it relates to our heart organ system and the energy which the Taoists called Shen. The heart can easily become imbalanced. Trauma, fear, heartbreak, betrayal of trust and grief can all cause us to close our hearts to the world and stop embracing life and feeling our intrinsic connection to all things. Then, the more isolated we become, the more the illusion of powerlessness and apathy starts to set in. We tell ourselves that we’re too small, that the world’s problems are too big, and that there’s nothing we can do. From a Taoist point of view, when this happens a person loses Shen — they’ve given up, to some degree, on really being alive, on the compassion they feel for all beings, and on their sense of purpose. However, some people don’t fall into this trap. They fall into a different one! There’s another type of person who never gives up. Instead, they get mad, really mad. They push themselves harder and harder and refuse to stop. However, they’re often prey to frustration, anger and impatience, and again, Shen recedes. These people do try really hard to make the world a better place but their impatience usually gets the best of them and significant progress is relatively rare. Shen tends to decline. So at this point you may be wondering — what is Shen? Shen is that energy you have in abundance when the heart is in balance. Shen gives you passion, enthusiasm, confidence, purpose and vision. However, it also gives you patience, good judgement, perspective, humility and sobriety. Can you see how these qualities combined can enable someone to make a tremendous difference in the world? Can you see how if you had enough Shen, you could achieve anything with poise, ease and grace? There are two aspects to Shen and the heart. Sometimes we need to stimulate the heart and wake it up. This is often referred to as ‘opening your heart’. Conversely, sometimes we need to cool and calm it down. Sometimes both are appropriate. Generally Shen herbs come in two classes, stimulating and calming. Some do both. Cacao, or chocolate, is one of my favourite herbs for waking the heart up, and sometimes in a quite spectacular fashion. Theobromine, one of the active ingredients, is a cardiac stimulant and a vasodilator, a scientific way of saying heart stimulating. It is by far the most popular and well-known plant for opening and awakening the heart. Of course, when it’s raw and high quality, it’s far more powerful in this regard. The other type of herbs that are great for aligning you with your life purpose are Shen calming herbs. 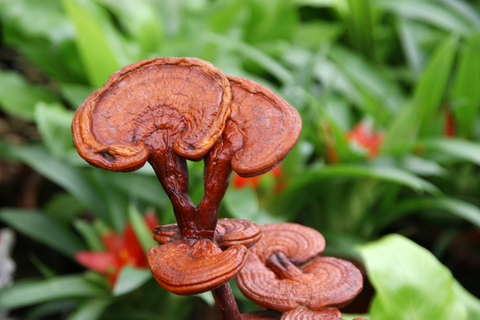 One of the best known and popular of these is reishi mushroom. It actually both calms and stimulates but it’s heart-awakening effects aren’t nearly as dramatic and overt as cacao. Reishi’s most beneficial use is to calm the heart. It’s also very healing, clearing out old hurts, resentments and blockages. This allows energy to flow freely and calmly through the heart, so you embrace life with grace and calm. It is an excellent idea to balance heart-opening herbs with heart-calming herbs. I enjoy consuming a little raw chocolate along with a cup of reishi tea. Finding out what you’re here on this planet to do, and then doing it, is the most important task you can undertake in this life. However busy you feel you are, there’s actually nothing more important. Once you know your mission, all that you then need is the energy to make it happen. The post Reishi mushrooms — could they make the world a better place? appeared first on Superfood blog - Healthy, Rawfood Lifestyle.